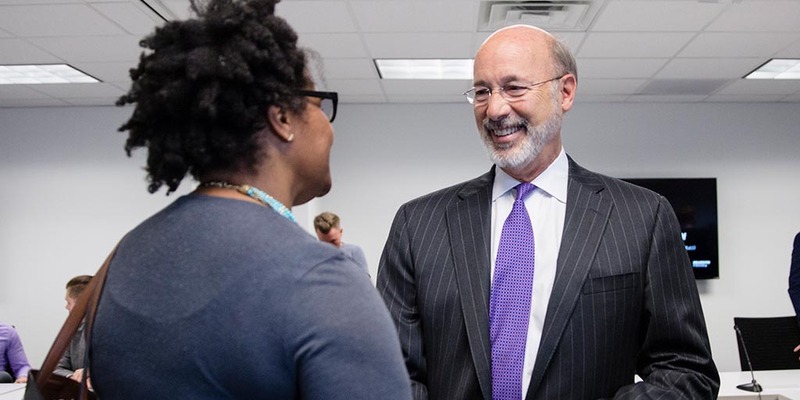 Harrisburg, PA – Governor Tom Wolf, the Department of Labor & Industry (L&I), and Team Pennsylvania today announced that $270,000 in Career Readiness Mini-Grants have been awarded to 64 school districts from across the commonwealth. The grants support an assortment of activities for students to learn about career opportunities, and to build stronger connections between schools and employers. L&I awarded a grant to Team Pennsylvania in June to fund career-readiness projects of up to $10,000 each. Team Pennsylvania partnered with the Pennsylvania Association of Intermediate Units (PAIU) and Intermediate Units (IUs) across the state to review applications and select grantees, awarding $30,000 in each of the nine regions in the commonwealth. “This project perfectly aligns with our organizational principles of partnership and ensuring Pennsylvania’s economic prosperity,” said Ryan C. Unger, President & CEO of Team Pennsylvania. “Pennsylvania’s 29 Intermediate Units are positioned to facilitate partnerships and connect schools throughout Pennsylvania to the programs and resources needed to support robust Career Awareness and Readiness activities that will engage students in developing meaningful career dreams that can become a reality,” said Dr. Linda Hippert, Executive Director of the Allegheny Intermediate Unit. The project will work to promote collaboration between the K-12 system and the workforce system on a micro-level. Successful applicants are required to work with their local Workforce Development Boards and base their work on regional labor market needs. Building partnerships between schools and businesses to create future career readiness opportunities for more students. These career-readiness activities were created in support of the Department of Education’s initiative of expanding options for students to demonstrate their readiness for college, high-demand industries, or the military. The career readiness mini-grant project will identify best practices to share and replicate throughout the commonwealth. Team Pennsylvania is a non-partisan, charitable, non-profit created in 1997 to bring government and private sector leaders together for the betterment of Pennsylvania. The Pennsylvania Association of Intermediate Units works to ensure the strength of individual intermediate units, and to strengthen the system of intermediate units. IUs serve as liaisons between local schools and the Department of Education. Every year, more than 175,000 students and 75,000 educators and adults receive services from one of Pennsylvania’s twenty-nine intermediate units. A complete list of school districts that were awarded the mini-grant can be found on the Team Pennsylvania website at www.teampa.com/minigrantawardees.